Big shout out to Joni for winning the first "Pagerize" challenge. She gets bragging rights, next pagerize creator, and rights to pick the next winner. 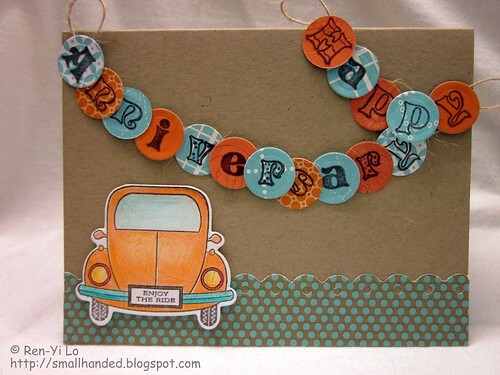 So come play along on Scrap Our Stash Challenges. The inspiration page that Joni has created is located here. I tried a twist on creating a banner, but instead of the cute triangles, I opted for little round circles. Here is hoping that there was enough adhesive to adhere them to the twine. Super cute!! I really think I will be stealing the idea for the round banner pieces! Once again a great take on the Pagerize This Challenge. You do a great job of taking inspiration from the original layout and running with it! So, unlike me! Love it! 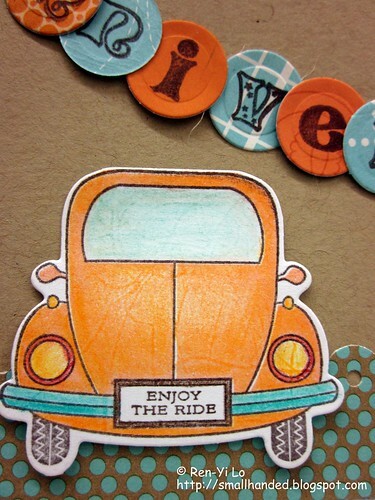 The card is great and I love the car and license plate! I ABSOLULTEY LOVE LOVE LOVE this card!!! I love the orange and teal colors on the Kraft and your title banner is TO DIE FOR!!!! I love the circle idea...I'm stealing that too!!! Thanks for the kind words too! You rocked this challenge!!! As always, your card is just so cute! I love that banner! Great alternative banner! Now to get creative myself! Gorgeous card!!! Love the car and the banner is great too! !